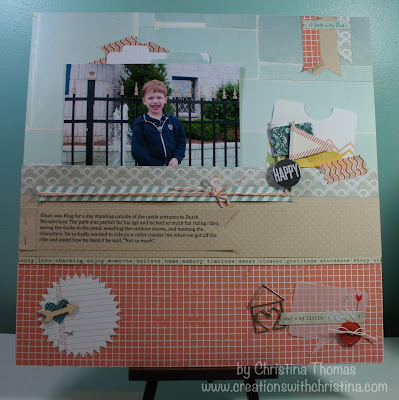 Most of the papers for this layout came from an older Studio Calico Kit that I never used. I did cancel my subscription to the kits but now I'm determined to start using them instead of hoarding them on a shelf. This picture of Ethan was from 2007 when he was 5, we had taken him to an amusement park here in PA that was geared towards kids his age. He could not wait to get on a roller coaster and talked about it for days before. When he got off the ride we asked him how he liked it, his reply "Not so much". One thing I've been seeing and learning a lot about with scrapbooking is creating clusters of embellishments and how they make the page flow. Most of these little embellishments are from older Studio Calico kits and some are from my stash. I can't get over how much Ethan has grown. Those 5+ years have just gone by so quickly. Thanks everyone for stopping in today. 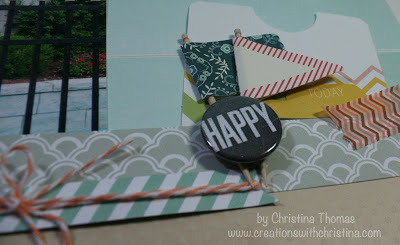 I'll be back Friday with the first Stampin' on Friday video for 2013. Love to see you scrapbooking again! Love your layout Christina. I enjoy Shimelle and have learned alot from her and how she "clusters". So glad to see you doing a l/o with a five-year-old picture! Ethan hasn't changed much - still adorable. I'm feeling less guilty about not having finished 2011 photos. You should feel guilty at all...I'm 11 years behind :) lol have lots to get caught up on. Christina this layout is so cute! I like the colors and how cute was Ethan!!!! Adorable!!! Happy New Year! 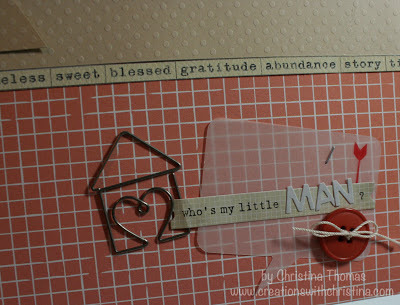 Great layout, love the clusters. I never seem to have any luck with that style. 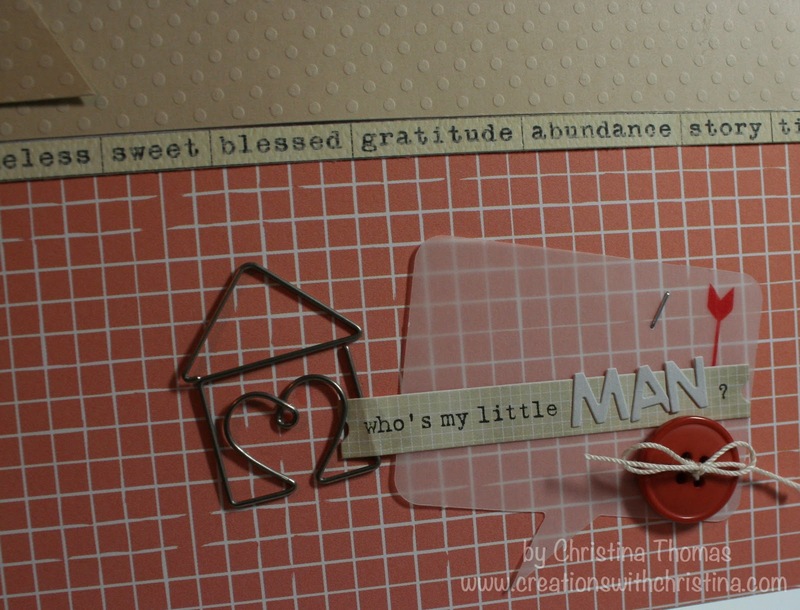 What a sweet layout, love the tip about embellishments. What a handsome boy! Love your layout of your little man. boys. Time does go very fast. My son is 13. It seems like yesterday we came home from the hospital with our bundle of joy. Enjoy every moment. I have. This layout is super cute. I hear you about hording your kits. I canceled my sub. too even though I love there kits. My goal this year is use the kits I have first and then work on my stash. After that I plan to scrapbook and do PL from the kits and sub. a little here and there. It makes no since for me to have an awesome stash and never use it. Wonderful layout! Love this so much. 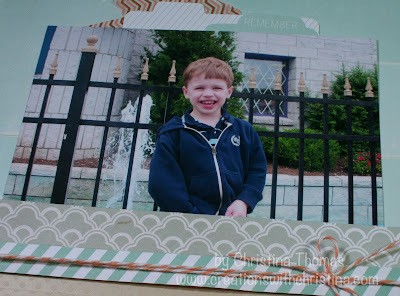 and Evan is just so cute...he sure has grown up! My baby will be 26 on the 21st of this month. The years have passed by way too quickly!! !